Every day, walking up and down the main street of my town, I’d only have eyes for the cinemas, three that showed new films and changed programmes every Monday and Thursday, and a couple of fleapits with older or trashier films that changed three times a week. I would already know in advance what films were showing in all five theatres, but my eyes would be looking for the posters they put up to announce the next film, because that was where the surprise was, the promise, the anticipation that would keep me excited through the days to come. Calvino’s is one of many memoirs of the moviegoing experience. One could also cite Roland Barthes’ notable essay, “Leaving The Movie Theatre”. They evoke an ‘atmosphere’ of moviegoing that is almost long gone now – a world still populated by small local theatres whose programming was dictated by anything but the current global marketplace. It is the kind of world to be found in Luc Moullet’s Les Sièges de l’Alcazar (The Sieges of the Alcazar, 1989), the type of theatre in which an erstwhile cinéphile can seek out the films of Vittorio Cottafavi(!) 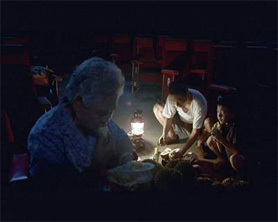 or Tsai Ming-liang’s heartfelt elegy to a neighbourhood cinema on its last legs in Bu san (Goodbye, Dragon Inn, 2003). capturing their feelings about “the motion-picture theatre”. The interpretations of this assignment vary in ways that are interesting: some are about the cinema in general, but most reflect on the conditions of viewing: in other words, the physical “salle de cinéma” itself. However, it begs the question: outside of the Cannes screening, how many cinéphiles will actually see this work in a movie theatre? It already circulates as a DVD and, given the duration of the individual films, they seem suited for YouTube or iPod streaming. Their destiny is, ironically, anything but the physical “salle de cinéma”. And it is where the cinema is now: caught between the lingering patina of memories attached to the particular movie-theatre experience on the one hand, and the new multi-platform distribution and viewing of films on the other. So, for better or worse, Newfield’s work is everywhere. With the coming of the worldwide web, downloads of Newfield’s more popular films are now readily available for free, for use on cell phones and video iPods, from a number of archival websites. Try writing an essay on ‘leaving the movie theatre’ in this day and age.